If you wholesale to retailers, I think we’re finished with the “one size fits all” business model. Today, everyone wants to be able to offer that unique thing. The one that is just right for them and gives their customers something that no one else has. So here’s the lesson we learned. When we started our first brand, “Schmutzerland”, there was a nice groundswell of interest. 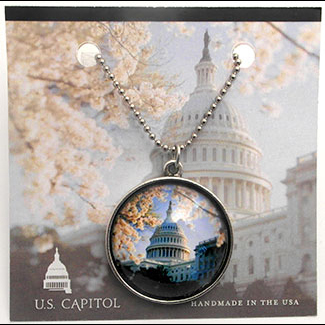 We offer jewelry that has images under magnifying cabochons in vintage style settings. We use an array of images that is thought provoking, sometimes humorous, classic, vintage nature, geography and personalities. However, we started seeing, that as time moved on, people’s attitudes changed. So we had to change. We now have five customizable brands, which allow us to easily move with the market and offer solutions to marketing issues that our clients have. Can you do that? No matter what we do, our core concepts do not change; we just tweak it a little. Are you able to look at what you offer each of your customers or potential customers and see what tweaks will give them a unique advantage? In the personal accessories space that we play in, the biggest issue we hear; is the competition down the street has the same things they have. So how do we help? We customize. 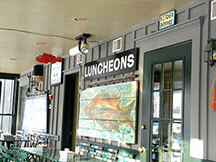 We have found, each store, museum or organization we sell to, has a certain clientele. So we can tailor a collection that meets each retailer’s individual needs. We don’t do anything different. We just change the images. By doing this, we actually help our customers create their own line, which in turn can become their own branded line, if they choose to go in that direction. This can be done for businesses that are in close proximity to one another and they don’t have to feel like they are invading each other’s space. So look at your process. Where can you give your customers that unique advantage? Is it in customizing the graphics on your packaging? Maybe you can offer special color combinations or easily tweak some design elements that make it easy to distinguish available products from one venue to the next. Remember, you’re not changing the core of what you do; you’re just tweaking things a little. It’s that flexibility that helps keep the interest in what you do. So, we like stories and we especially like to hear stories about Schmutzerland. Well, our good friend Meg at Modern Love in Frenchtown, NJ told us this one. A customer is browsing through her shop, along with all the other incredible things she has there, notices the Schmutzerland jewelry that is on display. 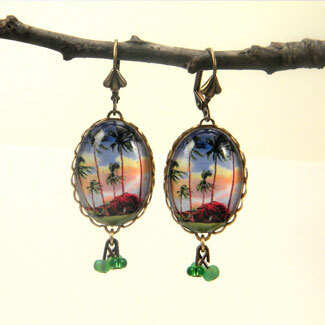 So the woman is eyeballing our unique image based jewelry and says “These pieces look like something I bought in Hawaii.” She goes on to say that she had bought a pair of earring in Hawaii, they were her favorite earrings and as things go, she lost them. Very sad about this and wanting a replacement, she asks our hero Meg, “Do those Schmutzerland people make something that has a tropical theme?” Of course Meg, tells her, they do. So they look at the Schmutzerland catalog, and yes, there is the Schmutzerland Hawaiian “i” Collection. 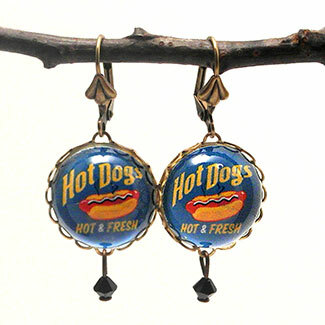 A moment of disbelief and then the woman says, “That’s it, they they are, those are me favorite earrings.” OMG!!! It’s the Little Grass Shack Earrings. Well, who would have thunk, that you would have been in Hawaii and then gone all the way to Frenchtown, NJ to find the thing you lost. It just goes to show you, Schmutzerland really gets around. As the Delaware River lazily meanders under the Frenchtown-Uhlerstown Bridge, we sip our coffee on the outdoor patio of the Bridge Café. Contemplating what life was like when this great old building was the original train depot, we’re thinking, how much has changed in this sleepy town, since the train stopped running. The great old vintage buildings are still intact. You can see some evidence of the business and industry of the past in faded paint on the rusty old brick walls. But there is new life here now and Schmutzerland is happy to be a part of it. 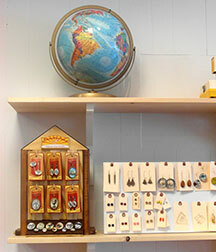 You can find our jewelry in Modern Love on Bridge Street. Run by the ever-fascinating Megan Metz, this store is one of the best-curated shops we have seen. Artfully combining new and vintage things from clothing to cards, jewelry to those fantastic accessories you might not need, but just have to have. She has great old typewriters and take a look at her collection of vintage miniature sewing machines. 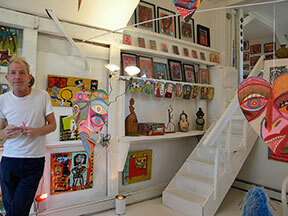 No visit to Frenchtown is complete until to go to the Outsider Art Gallery . This gallery is a tribute to the soul and spirit of American artistic ingenuity. Run by Dion Hitchings, who has graciously allowed us to put his original artwork in jewelry , this space showcases work by untrained artists that use the world of the visual to express their inner most feelings. Here you can see and buy work by a group of artists called the “A Team” from the Trenton Soup Kitchen, as well as works by artists that use found objects to tell their stories and ideas. Dion’s heart felt enthusiasm and feelings for all of his artists is evident after hearing him describe each artist’s situation and inspiration. I know that at one time or another, we feel at a loss to find that meaningful gift. You get the feeling of how do I give something to someone that seems to have everything they need. Well from watching others that have the “meaningful gift” knack, the key word is “observation”. It’s an awareness that you can develop, while you’re around someone. Take a mental note, what was that little remark about what that guy was wearing? How about the fact she thinks classic mystery stories are interesting? Maybe your friends are really into pirates. designs that Schmutzerland now makes. We have learned people love wearing things that have a special meaning to them. It could be an image of a famous author, personality or historical figure, a special flower, an insect or an animal. Some folks like things that have a vintage, nostalgic look. Others like to show off things that relate to where they are from or where they would like to go. If you want to give a meaningful gift, just listen and observe, take a mental note. Then look for the thing that sparks that interest. So, you have to be on the alert all the time. Be sensitive to what your friend and/or significant other is saying, doing, looking at or wishing for. You don’t always have to give the exact thing, because it may be a little difficult to give a clipper ship, but you can give a clipper ship necklace pretty easily. So now we have a news report by Elisa Cervone from Long Island News. All about Schmutzerland. Well, I guess you get a little behind the scenes look at how we do what we do.